ExpressAdapt overcomes power considerations of earlier 32-bit PC CardBus adapters providing 1000mA at 3.3V and 650mA at 1.5V. With the ability to supply power on both ExpressCard rails, newer cards like the Option Wireless GT Max 3.6 Express are fully supported. Crafted with the highest quality connectors and frame materials, ExpressAdapt meets or exceeds the requirements of every standards body it falls under. 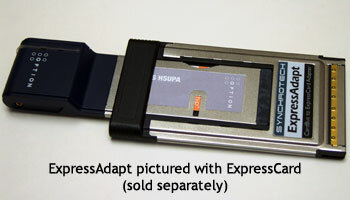 ExpressAdapt is a PCMCIA PC CardBus to USB ExpressCard Adapter. It works with USB 2.0 Mode ExpressCards only. This includes WWAN Wireless broadband cards like the Kyocera KPC680 and the Sierra Wireless AC597E. Like all PC Card to ExpressCard adapters, ExpressAdapt does NOT work with PCIe based ExpressCards. ExpressCards using the PCI Express (PCIe) portion of the ExpressCard standard include very high performance devices like FireWire 800 and eSATA host adapters.